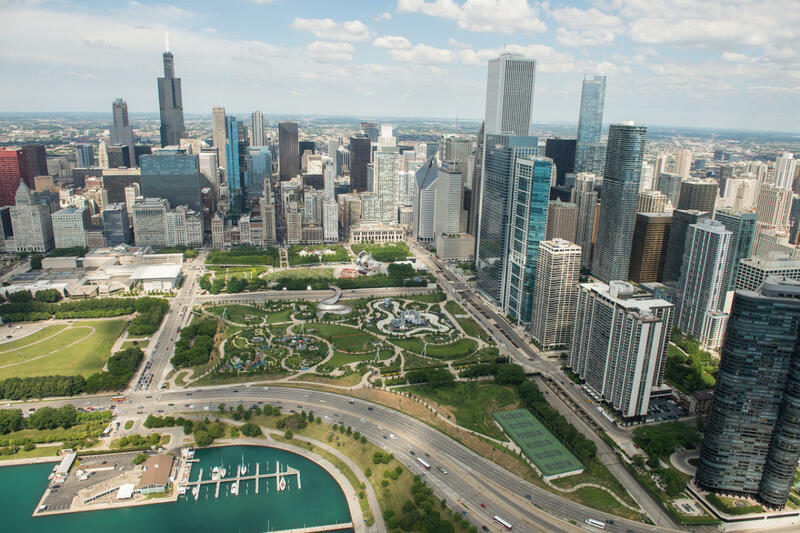 Maggie Daley Park is one of Chicago’s newest spectacular green spaces in the heart of downtown and connected to Millennium Park via Anish Kapoor’s BP Bridge. 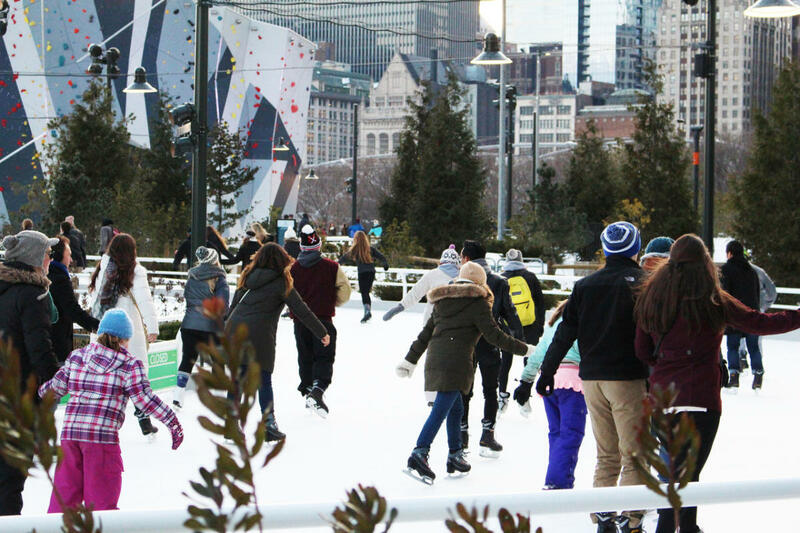 Opened in late 2014, Maggie Daley Park became an instant success due its unique “Skating Ribbon” and magical “Play Garden”. Additions to the park in 2015 include the rock climbing and bouldering walls, an 18-hole miniature golf course, and picnic groves. The 3-acre Play Garden, a first of its kind in Chicago is in the spirit of Alice in Wonderland and Charlie and the Chocolate Factory. Play and plantings are intentionally different from usual garden and park settings, capturing the imagination, engaging different senses in all seasons of the year, and integrating landscape with custom-designed play structures and sculptures. The Play Garden has diverse opportunities for fun, adventure, exploration, and learning for children of all ages, such as the short cut leading from the small intimate spaces of the Enchanted Forest to the high prospects within the Slide Crater. The skating ribbon is dramatically different from typical ice rinks. Skaters can experience “alpine in the city” as they follow a path twice the length of a lap around a traditional skating rink. Complementing the ribbon are places to enjoy a cup of hot chocolate and rent skates. In the summertime, the Ribbon can be used to watch climbers on the climbing wall or children are welcome to walk or ride scooters on the ribbon. 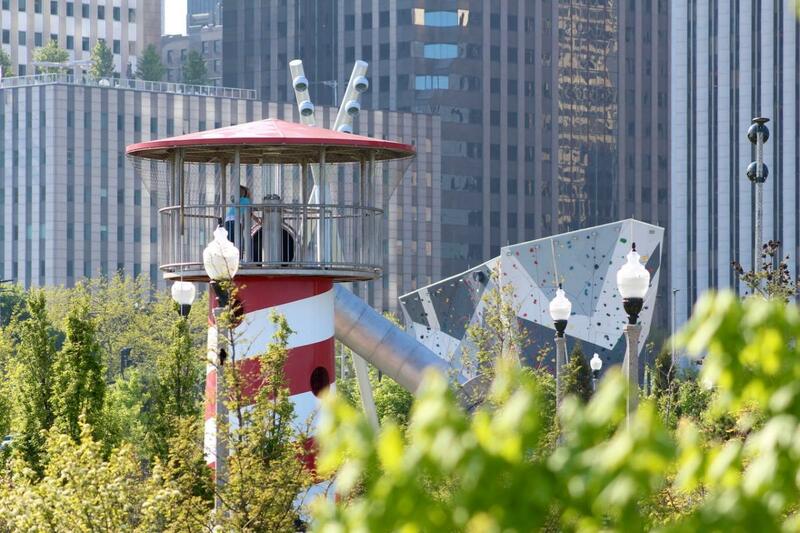 At the center of the Skating Ribbon sits two stunning rock-climbing structures that form Chicago’s first and only Climbing Park. These custom-designed sculptural rocks and boulders provide a unique outdoor recreational experience for beginners and experts alike, supported with instruction and supervision by park staff. 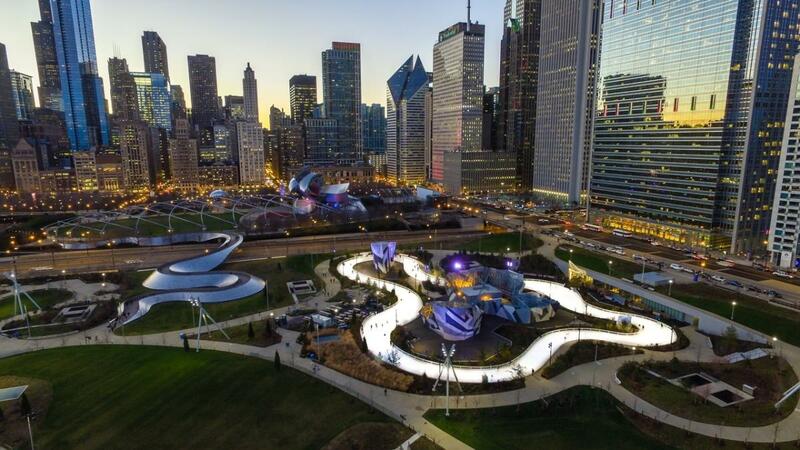 The combination of the Skating Ribbon and Climbing Park achieves the project aspiration of a park for all seasons, inviting and engaging to all Chicagoans and visitors alike. The rock climbing walls’ maximum height is 40 feet over a total surface area of 19,000 square feet. The wall is divided into a beginner and advanced wall with three different types of climbing: bouldering, lead-harnessed, and top rope. The climbing wall capacity is between 25 to 100 climbers at a given time.